Ana has joined another brand new project!! She is definitely scoring some great movies and 2019 will be one of the greatest years yet! She has joined Daniel Craig and Chris Evans on Knives Out which is due to start filming next month. Shoot is due to begin next month on the modern-day murder mystery which will see Craig star as a detective. Stanfield will also play a detective. Plot and character details are largely being kept under wraps. Star Wars: The Last Jedi and Looper director Johnson and regular partner Ram Bergman are producing. House Of Cards and Ted backer MRC is behind the project after splashing out big for it in Toronto. Distributors are expected to emerge for the hot package in coming months. Craig will most likely go from this to Bond 25. De Armas will next be seen in the untitled Danny Boyle project and Three Seconds opposite Clive Owen and Rosamund Pike. De Armas is repped by CAA, Impression Entertainment and Grubman, Shire, Meiselas & Sons. 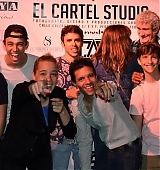 The film will be produced by Julie Yorn (“Hell or High Water”), former talent manager/ World Series of Poker champion Jamie Gold, Pollak, and Geneva Wasserman and Tim Marlowe of Project Z Entertainment. Moura will play Brazil-born diplomat Sergio Vieira de Mello in Greg Barker’s narrative directing debut. Narcos star Wagner Moura is set to play Brazil-born United Nations diplomat Sergio Vieira de Mello in a biopic for Netflix. Ana De Armas (Blade Runner 2049), Garret Dillahunt (Fear the Walking Dead), Will Dalton (Loving), Clemens Schick (Casino Royale), and Tony and BAFTA awards winner and Emmy Award nominee Brían F. O’Byrne (Little Boy Blue) are also set for the movie. The film is the narrative debut for Greg Barker, the documentary filmmaker behind Manhunt: The Inside Story of the Hunt for Bin Laden and The Final Year. Craig Borten, who earned an Academy Award nomination for penning Dallas Buyers Club, wrote the script that adapts the biography Chasing the Flame: Sergio Vieira de Mello and the Fight to Save the World, by Samantha Power, the former United States Ambassador to the United Stations. Brent Travers of Black Rabbit Media and Daniel Dreifuss of Anima Pictures are producing with Moura, who will produce via his banner, Itapoan. The movie is due to begin production in August, with a release eyed for 2019. Barker is familiar with Vieira de Mello as he previously directed a documentary about the man, 2009’s Sergio. The movie was nominated for an Emmy and won an award at the Sundance Film Festival. He is repped by Gersh. De Armas, who was seen in Blade Runner 2049, recently wrapped Danny Boyle’s untitled musical drama. She is repped by CAA, Impression Entertainment and Grubman Shire.